Professional Instruments (PI), a Hopkins, MN, manufacturer of air-bearing spindles and slides, recently was subcontracted to manufacture critical parts for the Mars rover. To ensure its measurements (using a bore gauge, gauge blocks and Mikrokator) were on track, the firm partnered with one if its suppliers, Andrew Tool, which used its coordinate-measuring machine (CMM), a Zeiss Accura, to check its key parts. Soon after, PI went in search of its own CMM, to allow it to, inhouse, measure critical air-bearing diameters. Holes are sized down to 0.25 microns to match shaft diameters, held to the same precision, on a line of air-bearing spindles. A CMM also was needed to measure tapers on a new hydrostatic bearing being developed. Tests performed at nearby Carl Zeiss Industrial Metrology in Maple Grove, MN, showed that the standard deviation with a Zeiss CMM for a 1.5-in.-dia. hole was approximately three times better than the firm’s previous measurement methods. Following the tests in 2009 the firm purchased a Carl Zeiss Contura G2 direkt CMM, boasting a maximum measuring rate of 150 points/sec. and a maximum sensor extension of 100 mm. “This was the perfect system for our unique hole-sizing application, and at an affordable price,” says PI vice president Dave Arneson. 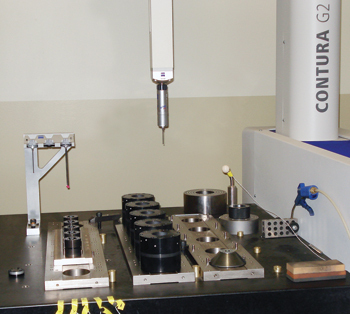 The CMM measures the spindle hole size after grinding and typically measures 50 to 100 parts/day. Hole sizes are fed into a proprietary program that matches the shaft to a corresponding hole to achieve the required flying height for the spindle. “For our 38-mm-dia. measurements, the CMM’s accuracy and repeatability exceed the Zeiss specifications,” says Arneson.